On Saturday, we went to the Houston Humane Society and looked at all the dogs. There were lots of too loud, too hyper and jumpy dogs, but the chihuahua mix wing seemed to be much calmer. 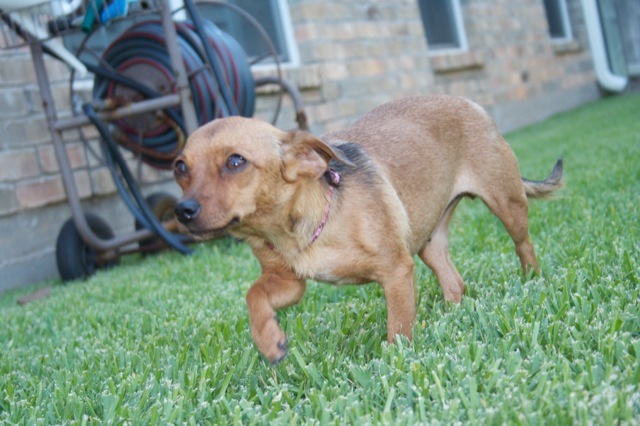 We looked at a minitiature pinscher and chihuahua mix, named Roscoe, but he was a little too much for us. Ella and Keith went back and picked a Chihuahua and Daschund mix named Yvonne to look at next. She was very sweet. We said we would take her home, but she needed to see the on site vet first, so we couldn’t pick her up until Monday. Jill brought her home, and the kids were outside waiting. After a little discussion, we found the perfect new name : Molly. Short for Tamale. I love that the stem of a wine glass is visible in one of Molly’s coming-home pics. That’s so very Cremer! That’s a chi-weenie! Love it!